UNITED NATIONS, November 6 -- The day after the UN ejected the representative of a pro-Israel non governmental organization after she spoke at the General Assembly stakeout against and after the endorsement of the Goldstone report on Gaza, the Palestinian Observer brought to the Security Council stakeout four people evicted for settlers in Jerusalem. Video here. Inner City Press, which witnessed and covered the November 5 ejection, was informed that Patrick Ventrell of the U.S. Mission to the UN asked the UN Media Accreditation and Liaison Unit on what basis the evictees were speaking. MALU sources took this, not surprisingly, as a complaint or challenge from the U.S. Mission. For the record, when Inner City Press asked Ventrell if he had complained to MALU, he said no. He acknowledged that he was personally curious on what basis the people were speaking at the stakeout. When first asked about the November 6 ejection, he said he hasn't heard of it. When Inner City Press named the NGO, he nodded and said yes, he'd heard of it. He asked, who told you I'd complained? 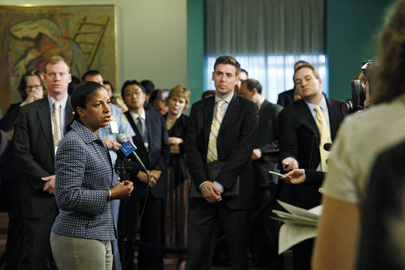 Another reporter, not able to write the story, offered that talk of a U.S. inquiry with MALU was "only gossip." Ventrell nodded. "And that's not good reporting." So for the record, beyond Ventrell's "round" denial, what we can and will report in the interest of adding another snapshot of how the UN works (or doesn't) is that MALU sources tell Inner City Press that his question about the basis on which the Palestinian evictees were speak was interpreted as a complaint. Spoken-with a second time, Ventrell genially emphasized that he was only asking the MALU staffer. But when one represents the world's most powerful country, even one's questions can be interpreted as more than that. And so it goes at the UN. The largest question raised -- what are the UN's rules for who can speak at the stakeout? -- has still not been answered. A senior UN official scoffed that he's never heard of the NGO ejected on November 5, but had heard of Human Rights Watch, which he said is holding an event in a museum in New York. Mia Farrow was allowed to speak at the Security Council stakeout -- but she is a UNICEF Goodwill Ambassador, it was pointed out. So what are the standards? MALU says to "ask the Spokesperson's Office." Watch this site. For the record, Sharihan Hannoun who spoke at the stakeout said she has 38 people in her family, faces living in the street after eviction since there is not enough space in Jerusalem. Another speaker described a neighborhood of 55,000 Palestinians run by 300 settlers. A map in a blue folder marked "Secret" distributed by a woman on Mansour's side of the stakeout shows a neighborhood under threat, next to the American Colony Hotel where the Quartet's -- and Europe's? -- Tony Blair keeps up his rooms. We'll have more on this. At UN, Pro-Israel NGO Is Out of Place, "Did We Capture Them?" UNITED NATIONS, November 5 -- Moments after the UN General Assembly voted 114 to 18 with 44 abstaining to endorse the Goldstone report on war crimes in Gaza, three speakers took to the UN Television microphone and spoke to the Press. 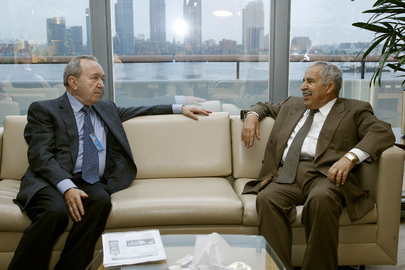 First was Assembly President Ali Treki of Libya, who took only one question. Next was the Permanent Observer of Palestine Riyad Mansour, who took questions in both Arabic and English. Inner City Press asked what Mansour expects of the Security Council, whose Permanent Five members fought against the referral of the Goldstone report. Video here, from Minute 5:47. Finally a short woman took to the microphone, criticizing the resolution for not mentioning Hamas. Journalists took notes, one later telling Inner City Press he thought she was from the U.S. Mission. In fact, she was Anne Bayefsky of the Touro College Institute for Human Rights -- that is, a non governmental organization or NGO. Two and then four UN Security officers arrived. After Ms. Bayefsky finished, they surrounded her and a young man she had brought into the UN with her. She was asked, How did you get him in? What type of UN pass do you have? The two were marched down to the UN Security office on the first floor. Just then, Palestine's Observer Riyad Mansour walked back the General Assembly. Inner City Press mentioned that a seeming pro-Israel NGO had spoke at the stakeout after him. Mansour stopped and asked, "Did we capture them?" 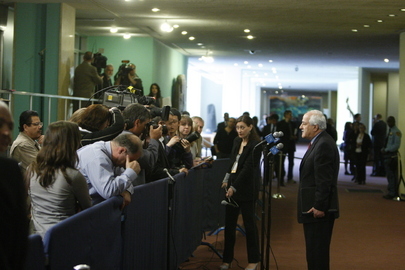 Palestine's Riyad Mansour at a stakeout, "did we capture them?" Inner City Press went down to the Security office. Minutes later, Ms. Bayefsky and her colleague were marched out by two blue shirted guards. Ms. Bayefsky called Inner City Press over. "This is your story," she said. As Inner City Press took notes, one of the guards asked that the interview wait until Ms. Bayefsky was escorted out onto First Avenue. Missing, one wag mused, was the K-9 unit. Some on the other hand view it as a crackdown after the UN and UN Security were embarrassed by KFC's Colonel Sanders impersonator being invited to take photos with GA President Ali Treki, apparently by Treki's daughter who works in the Office of the President. But was Colonel Sanders escorted to the Security Office and then out to First Avenue? Watch this site. UNITED NATIONS, November 4, updated Nov. 5-- With the debate in the UN General Assembly on the Goldstone report taking a lunch break, negotiations continued on a European-led proposal to not "endorse" the report, but only "take note" of it. A well placed Arab diplomat told Inner City Press that a compromise was possible: to "welcome" the report. But what about referral to the Security Council? The Arab diplomat said that many European Union nations have no problem with this, that the most opposed are the UK and especially France. Meanwhile, U.S. Deputy Permanent Representative Alejandro Wolff, asked the Press if the U.S. will join the 43 speakers set to address the General Assembly about Goldstone, said no, "we will not speak on that stage." At the day's noon press briefing, Inner City Press asked the spokesman for GA President Ali Treki if Sudan and Syria are sponsors. No, he said, or not yet. You have to go based on what is printed. Video here, from Minute 26:56. Inner City Press asked, what about the so-called French and UK draft. He said there is only one resolution on the table, that introduced by Egypt. A senior European diplomat told Inner City Press that the negotiations are being led by Sweden, and that the longer the debate goes, the longer they have to negotiate. Watch this space. Update of 3:10 p.m. -- Ali Treki has canceled his 4 p.m. press conference, re-scheduling it for sometime on Thursday. As diplomats streamed back into the General Assembly, the representative of the League of Arab States stopped to speak to the Press. Asked about Obama, he said "he is a good man, he means well, but actions speak louder than words." If the settlements don't stop, there can be no negotiations, he said. "So are we back to where we were when Obama took office?" Yes, he said, basically we are back to square one. Update of 3:19 p.m. -- Riyad Mansour, the Permanent Observer of the Palestinian Authority, speechified to the Press about the days debate. He predict that the Assembly will "endorse" the report, and that if the doors of the Security Council remain closed, that all who've signed on to the Fourth Geneva Convention will have to "bring to justice" all possible defendants. Asked about the U.S. position, he said, "you have to ask Susan Rice." A reporter answered, "But she won't answer." Mansour shrugged and went into the Assembly. Update of 3:35 p.m. -- on his way into the General Assembly, Sudan's Ambassador said with a smile that the day's events show the "double standards and selectivity" of the UN system. The Security Council took up the International Criminal Court in the case of Sudan, but won't on Israel. He pointed out that some countries close to Palestine are uncomfortable with the draft resolution, either because they don't want human rights issues in the Security Council, or don't want to mention the ICC, or both. The Press asked, Isn't that Sudan's position? We just want to expose the double standards, was the answer. Update of 5:24 p.m. -- and the beat goes on. Nicaragua's representative begins by thanking "Libya" for arranging this General Assembly debate. So does Ali Treki work for Libya? Is his work attributable to them? Djibouti takes the floor. They have their own problems with Eritrea, and diplomatically, Inner City Press is told, with Uganda. Update of 6:02 p.m. -- and precisely at six p.m., the interpreters' deadline, the session was closed, to re-open Thursday morning. Watch this site. Updates of Nov. 5, from 4:37 p.m. -- the vote has been called, on the draft resolution without any amendments. In an explanation before the vote, Alejandro Wolff of the U.S. denounces the Goldstone report and Hamas, and the resolution for not naming it. Update of 4:45 p.m. -- the vote has been taken: 118 for, 18 against, 44 abstaining. Norway explains abstaining: Egypt refused to taken any of its amendments, only wanted to "politicize" the Middle East. Update of 4:59 p.m. -- Heraldo Munoz of Chile's talking, he who is in charge of the investigation of the murder of Benazir Bhutto, still pleading to interview Pervez Musharraf in London. Update of 5:19 p.m. -- India voted for the resolution, but did not endorce the International Criminal Court, it points out. UNITED NATIONS, November 4 -- The Goldstone report on war crimes during this year's Gaza conflict will be debated Wednesday in the UN General Assembly chamber. What at the UN is called a debate is really just a series of speeches. Before the first one began, an Arab representative predicted more than 100 speakers, including the entire membership of the Non Aligned Movement. The spokesman for Ali Treki, president of the General Assembly, put the number of speakers at 43. Behind this Kibuki theater there is a resolution subject to vote most probably on Thursday or Friday, which currently would call on UN Secretary-General Ban Ki-moon to report to the General Assembly, within three months, on implementation of the resolution "with a view to considering further action, if necessary, by the relevant United Nations organs and bodies, including by the Security Council." While the U.S., particularly after its House of Representatives' vote this week against the Goldstone report, is the main opponent of considering the report in the Security Council, neither Russia or China is keen to have the killing of civilians taken up in the Council. Consider Ingushetya, Xinjiang and U.S. drone bombings in Afghanistan and Pakistan. The UK and France too have their own military actions to consider, in Afghanistan and Africa. Hence the theater, the empty hat tips to human rights. 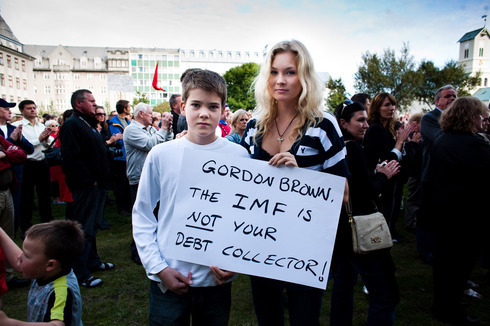 Click here for an Inner City Press debate on the Goldstone Report taped on October 30. And see live blog below. Can Hamas be expected to investigate itself? Israel says no. The Goldstone report, unlike the UN Human Rights Council resolution which endorsed it, does take Hamas to task. The current GA draft, to garner EU votes, also makes the reference. An uncomfortable vote is coming up. But first the debate, which we will be live blogging in the space below. Update of 10:04 a.m. -- outside the General Assembly, Sudan's Ambassador was in discussion with his Egyptian counterpart and others. It's a procedural question, it was explained, to be resolved in a few minutes. Update of 10:14 a.m. -- Ali Treki's spokesman Jean-Victor Nkolo tells a half dozen reporters there are only 43 speakers inscribed at this time, and that only one draft resolution has been submitted. What about that of France and the UK? Update of 10:41 a.m. -- Egypt's Ambassador is introducing the resolution, he refers to the "United Nations Commissioner," presumably meaning the Human Rights Council. There is the reference to Switzerland and the Geneva Conventions. Update of 1:05 p.m. -- at the day's noon press briefing, Inner City Press asked Treki's spokesman Nkolo about what's called the French and UK draft. There is only one draft, Nkolo said, suggesting that Inner City Press "ask the French." Update of 1:59 p.m. -- as the Assembly took a lunch break, the Press asked questions in the lobby. 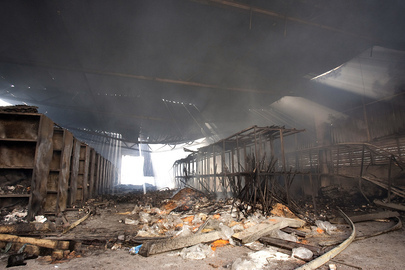 U.S. Deputy Permanent Representative Wolff said the U.S. will not be speaking, "we do not plan to speak on that stage." A senior European diplomat said that Sweden, not France, is leading the negotiations, and agreed that the longer the debate goes, the more time there is to negotiate.